Making 3-d art with kids is usually the best. That was definitely the case with this Louise Nevelson inspired building project we just (finally!) completed. As usual, we started by looking at and discussing some slides of original artwork. 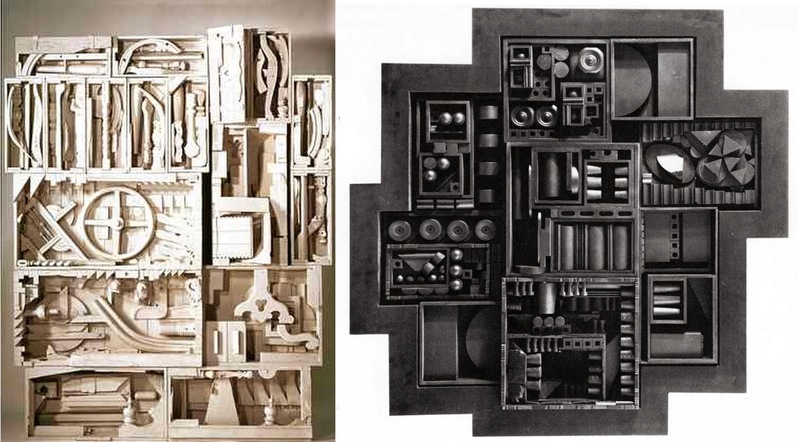 We looked at the intricacies and variations in Nevelson's iconic assemblages. My pre-Kindergartners exercised lots of decision making while choosing and arranging their supplies and securing them to a base. PS6 and PS7 went through almost three 10 lb. boxes of wood while learning about and identifying 3-d shapes they found in Pacon's "Treasure Chest of Wood". There's a great variation in size and shapes within the boxes - some kids chose lots of similar pieces, and leaned toward symmetrical arrangements, while others threw caution to the wind and took a more random approach. They arranged their supplies (wood from the treasure chests, buttons, beads, and abandoned puzzle pieces), then glued them down and w...a...i...t...e...d for them to dry over the weekend. Students then put one of our new vocab words to work, and choose a monochromatic color scheme for their work. A hanger on the back allows these assemblages to be hung vertically, so we can enjoy them gallery style in the studio. I find they also get pretty into process based art projects in the studio. 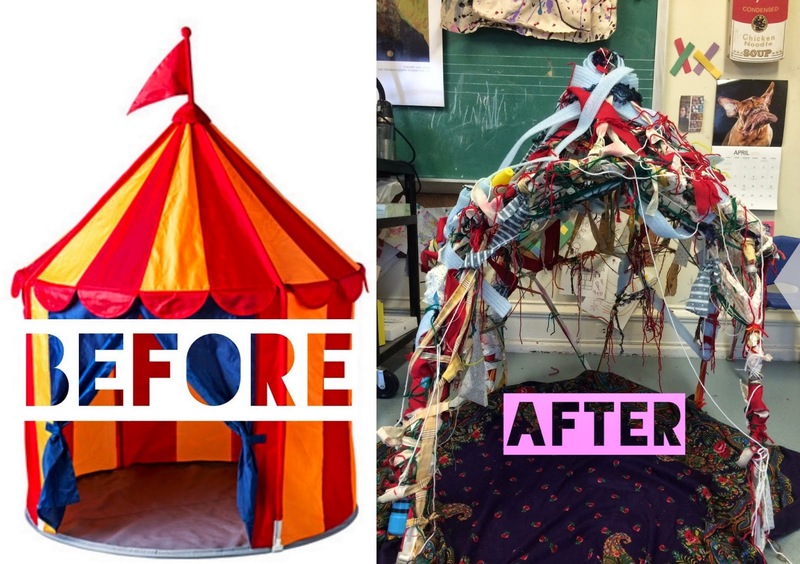 My pre-Kindergarten art classes at Settlement Music School studied the work of special needs artist Judith Scott, whose wrapped and woven sculptures have been recognized and exhibited throughout the world. Judith Scott wrapped both precious and mundane objects in her work, to the point where their original shapes became unrecognizable. Students learned about wrapping up tiny treasures with our substitute, Miss Emily. And they spent days wrapping our own special communal object, the skeleton of a well-loved but ultimately abandoned Ikea Cirkustält. I stripped it, then they wrapped and wrapped and wrapped and wrapped it. It was awesome to see the collaboration and decision making that went into this "no-rules" project. choosing which supplies to work with, and what to incorporate into their final design. Above is the view from inside. Like so many great installations, this one eventually had to meet it's demise, but it was just as fun to tear down as it was to wind up. A giant mess, but fun.